Petit is happy to invite you to join our wine club! Our goal is to help bring the com-plexities of wine to light. It’s undeniable that there is a certain mystique about wine. It’s lived through the ages and every bottle carries with it a unique story. We feel the experience with any wine is always enlightened by knowing the history and background of that particular vintage. In other words, “knowledge heightens taste”. We are inviting you to come experience this journey with us. Each month you will receive critically acclaimed handpicked wine from across the globe. 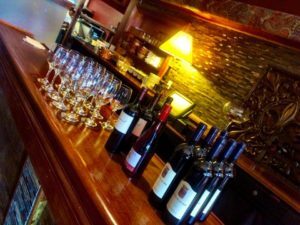 In addition you will receive expert tasting notes, member only food and wine pairing invitations, wine, beer, whiskey and scotch tasting invitations and exclusive discounts. No hidden fees and all wines are a hundred percent guaranteed. All bottles may be picked up at Petit Paree anytime after the ist of the month. Payment can be made monthly or in a lump sum. Payment is accepted through paypal, over the phone with a card, or in person with a check or card. When dining at Petit Paree as a member of ANY of our wine clubs you will be entitled to a 10% discount on wine purchased during your membership period. Discount will not apply to any wines on sale or previously discounted. If you would like to drink your bottle while dining at Petit you will receive 10% off of your meal for up to two people. As a member of The Adventure Club you will sample wines from around the world that are of incredible value. Wines will be specially selected for you and not usually available in larger “chain” stores. The Adventure Club is $30 per month and will include 1 bottle per month. The Premium Club will focus on complexity and high praise in the wine world. As a member you can plan on tasting wines that consistently score in the 9o’s from the best wine critics in the world. This club will primarily focus on California, Washington, Oregon, Australia and New Zealand (but maybe a good Italian or French wine too!). The Premium Club is $50 per month and will include 1 bottle per month. Our Premium Estate Club will showcase rare or highly allocated wines from the absolute pinnacle regions in the wine industry. These wines will have critic ratings that constantly score in the mid to high 9o’s. The Premium Estate Club is S90 per month and will include 1 bottle per month.